They will discuss a variety of topics, including cultivating positive self-care and relationships with compassion; teacher wellness through mindfulness, breath and movement; and the benefits of the hands-on emotional freedom technique and the Choose Love Enrichment Program. 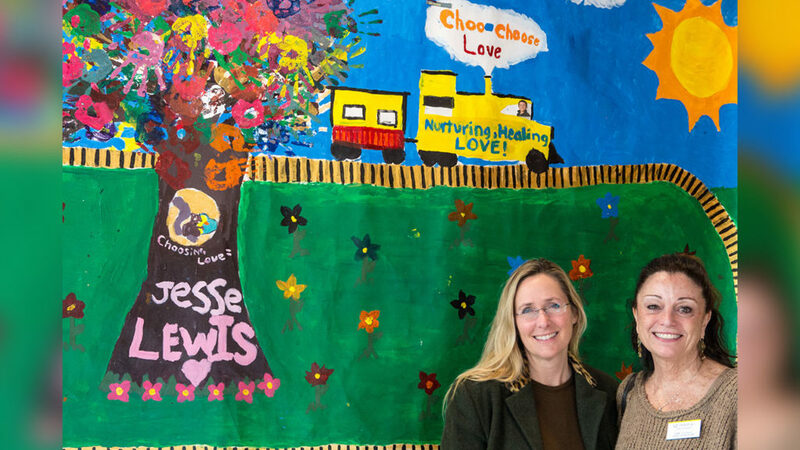 Scarlett Lewis, left, founder of the Jesse Lewis Choose Love Foundation, and Anne Dichele, dean of the School of Education at Quinnipiac University. Photo by Michelle McLoughlin. Area educators and other professionals in public service fields are invited to come to the Quinnipiac University School of Education, 370 Bassett Road, on Tuesday, Aug. 22, from 9 a.m. to 4 p.m. for the fourth annual Choose Love Educator Workshop, “Choosing Love: The Importance of Self-Care for Effective Teaching.” Admission is free, but registration is required at www.ces.k12.ct.us. The program will feature presentations by Chris Kukk, director of the honors program and founding director of the Center for Compassion Creativity & Innovation at Western Connecticut State University; Scarlett Lewis, founder of the Jesse Lewis Choose Love Foundation, which was created after Jesse was killed in the Sandy Hook Elementary School massacre in December 2012.; Allison Morgan, president of Zensational Kids; Nick Ortner, founder of The Tapping Solution; and Thomas Pruzinsky, professor of psychology at Quinnipiac. The Professional Development Services division of Cooperative Educational Services. is partnering with the Jesse Lewis Choose Love Movement and the Quinnipiac University School of Education to present the workshop. The mission of the Jesse Lewis Choose Love Movement is to create a more peaceful world by raising awareness that everyone can choose love in any circumstance; to ensure every child has access to the essential life skills that will empower them to choose love, and to help facilitate this by teaching these skills within their families, schools and communities.